Paco Díaz (Palma de Mallorca, Spain) on 14 January 2009 in Landscape & Rural. 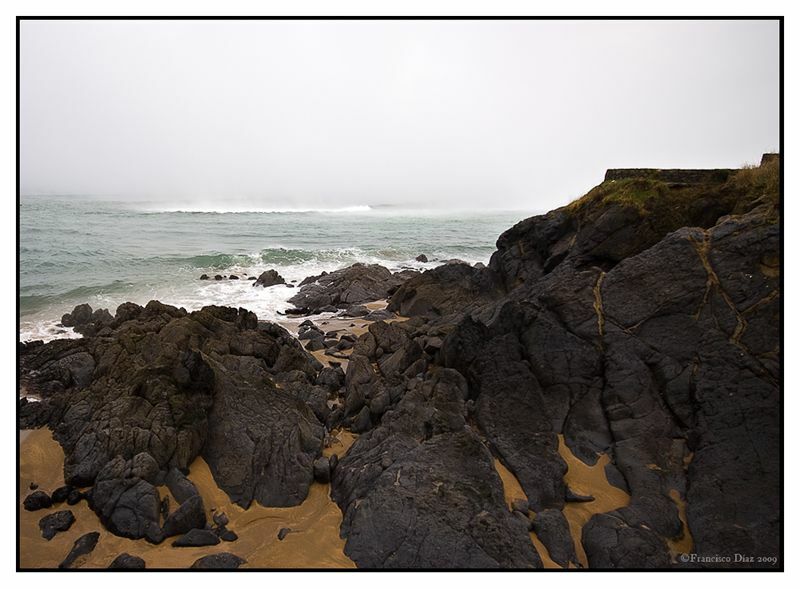 Same place and moment that yesterday's image: rocks, fog, wave. I really like this one, the colours are so strong against the sea. Very nice. ca me rappelle mon pays ! Love the details and view, outstanding. Another great photo, beautiful place for evening pictures! Like the limited colours and strong texture of this nicely composed picture. Enjoy very much the atmosphere you've captured... I wish I were there! The black rocks and brown sand make a beautiful contrast. Lovely sea too. You make it sound commonplace . . nothing ordinary about this image. I particularly like how the sand contrasts with the rocks. A splendid seascape...I love the beach. Wonderful view and really like the compo! Fabulous shot Paco, those waves look really strong out there. j'aurais bien vu un cadrage plus sérré en haut, éliminant du ciel... voire un format 16/9 !?! Molt bona, Paco. Esta es la última de Euskadi?.